Here are some observations from the January 16th Washington State Liquor and Cannabis Board (WSLCB) Cannabis Advisory Council meeting. The Cannabis Advisory Council (CAC) was formed in March 2017 by the WSLCB to engage industry, consumer group, and tribal stakeholders regarding cannabis policy. Originally structured as a quarterly meeting, the Council met twice in 2017 and twice in 2018, most recently on May 9th, 2018. Board Member Ollie Garrett led the Cannabis Advisory Council (CAC) meeting, introducing stakeholders and walking the Council through agency reports. There were several changes in representation on the Council. The Cannabis Alliance was represented by Danielle Rosellison, Alliance Board President and co-owner of Trail Blazin’ Productions. Frank Fauls of Evergreen GroPro represented the Cannabis Farmers Council (CFC). Cannabis Organization of Retail Establishments (CORE) was represented by incoming President Eric Gaston. Jeremy Moberg, owner of CannaSol, announced it was his last meeting representing the Washington SunGrowers Industry Association (WSIA) and that Executive Director Crystal Oliver would represent the organization going forward. Susie Gress represented the Washington CannaBusiness Association (WACA) and Bailey Hirschburg represented Washington NORML. Bill Sterud and Robin Sigo, representing the Puyallup and Suquamish Tribes, were not present. Angel Swanson of The Marijuana Business Association (MJBA) was not present. Anthony Ives, representing Sound Artisan Growing Ethics (S.A.G.E. ), was not present and is purported to have left the cannabis industry altogether. Garrett introduced Brett Cain, WSLCB Policy Analyst and Tribal Liaison. Bruce Turcott, Assistant Attorney General (AAG) sat in to listen. WSLCB Marijuana Examiner Manager Kendra Hodgson, Enforcement Chief Justin Nordhorn, and Jeanne McShane, Deputy Director of Licensing, were also in attendance and engaged in the Council’s dialogue. Board members shared recollections of their recent experiences in eastern Washington including the January 9th Board Meeting in Spokane. Board Chair Jane Rushford spoke about visiting Spokane-area licensees and representatives of the prevention community. “In the total it was so worthwhile,” Rushford remarked (audio – 2m). Board Member Russ Hauge talked about meeting with researchers from Washington State University (WSU) and the U.S. Attorney for Eastern Washington. Hauge indicated the agency intended to share evidence of serious crimes with relevant federal authorities (audio – 3m). Hauge and Director Rick Garza agreed that cannabis research was underfunded, with no increase planned in the governor’s new budget (audio – 4m). Initiative 502 (page 43) allotted “(c) Six-tenths of one percent to the University of Washington and four-tenths of one percent to Washington State University for research.” However, the corresponding statute, RCW 69.50.540(2)(c)(i), was subsequently amended to say “Up to six-tenths of…” permitting Washington research to be funded less than original intent of its citizens. Garrett announced the Board planned to host at least two board meetings outside of Olympia each year (audio – 3m). Board members discussed their trip in more depth at the January 15th Board Caucus. Policy and Rules Coordinator Kathy Hoffman updated the Council on open rulemaking at the agency (audio – 1m) and Director of Legislative Relations Chris Thompson briefed the Council on the status of WSLCB’s agency request legislation. Hoffman confirmed CR-102s for the following topics were coming over the next several weeks: True Party of Interest (audio – 1m, WSR 18-22-054), Marijuana Signage (audio – 1m, WSR 18-24-033), Cannabis Penalties (audio – 1m, WSR 18-22-099), Quality Assurance Testing and Product Requirements (audio – 1m, WSR 18-17-041), and Cannabis Production and Canopy (audio – 1m, WSR 18-01-058). Council members had several follow up questions (audio – 2m). Marijuana Signage is up first, scheduled for a public hearing at the January 23rd Board Meeting (CR-102 – unsigned, Issue Paper, Amending Language). At the state legislature, Thompson is pushing several bills on behalf of the agency which could potentially change the regulated cannabis marketplace (audio – 1m). A Budtender Permit bill will be sponsored by Representative Drew MacEwen to authorize WSLCB to implement a mandatory two-year permit and training program to work as a retail budtender. While many specifics are undeveloped, Thompson said the agency’s approach would be informed by its experience with the Mandatory Alcohol Server Training (MAST) program. Council members asked about collaboration and other concerns, and Thompson assured them it was early in the process (audio – 9m). Enforcement Uniformity legislation would broaden and clarify grants of authority for WSLCB Enforcement Officers (audio – 1m). Asked about the intent, the Council was told the bill addresses a gap in authority to enforce areas of the Title 9 penal code in the same way Title 66, the state’s alcohol control chapters, explicitly permit enforcement at alcohol venues. Enforcement Chief Justin Nordhorn described the bill as nothing new: “This has been part of our strategic planning goal for the last six years. This is, actually, predates cannabis in some areas” (audio – 4m). Testing Lab Accreditation legislation had not been introduced yet as WSLCB and the Department of Ecology (DOE) continued to iron out differences in preferred language. Thompson pointed to the Department of Ecology’s draft report on Cannabis Laboratory Accreditation Recommendations. Several council members weighed in on the importance of an effective testing regime (audio – 7m). The agency was also pursuing an extension of the Systems Modernization Project (SMP) account (audio – 2m) and an alcohol promoter bill (audio – 1m). CORE President Eric Gaston asked about special use permits and Hauge replied they’d had those discussions and saw the merit, but hadn’t found a legislative champion (audio – 5m). A far-ranging “Around the Table” discussion about ways to assist small businesses, promote greater equity and diversity, and general rulemaking and policy ideas led to engagement from the entire Council. Rick Garza explained equity issues weren’t structured into Initiative 502 in 2012 and the agency was learning from programs created by more recent adult-use states such as Massachusetts’ Social Equity Program, California’s local and state equity policies, and Labor Peace Agreements. An extensive talk about equity and diversity followed (audio – 16m). Hauge wondered if limited vertical integration, similar to the state’s approach to craft breweries and wineries, would improve the market. Cannabis producers could sell to adults directly under limited circumstances. Susie Gress from the Washington CannaBusiness Association (WACA) was very supportive, as was Bailey Hirschburg of Washington NORML. Rosellison and Moberg were cautious of the details, but interested. Hauge realistically said, “there’s no proposal that is going to affect everybody in an equal positive fashion” (audio – 2m). Gress later noted it would be complicated, but she’d heard small wineries made up to a quarter of their income from direct-selling to consumers, an “enormous” potential difference for Gress’s company, Vashon Velvet (audio – 3m). Garrett indicated WSLCB was expecting a report from the Canopy Analyst Team to better understand cannabis production in the state. Hodgson said the January 23rd board meeting would include an update on trends noted in the report before it’s full release. Hodgson indicated the team was already talking to departments within the agency about addressing “those big buckets of trends.” Moberg said WSIA had independently analyzed the canopy data and shared their findings with the agency (audio – 2m, WSIA canopy analysis). Garrett asked for suggestions of industry or stakeholder groups that should be part of the Council going forward. Garza suggested the associations present had relatively few licensee members (audio – 2m) and proposed including the perspective of testing labs on the Council (audio – 2m). On cannabis overproduction, Moberg said enforcement of canopy limits was an obvious place to start: “One person can get a citation, and you’ll get 90% compliance the next day on that rule.” Hauge argued that Washington had “the best funded enforcement arm of any of the regulated states” but that they were at their limit. “The kinds of investigations you’re talking about are theoretically possible,” the former Kitsap County prosecutor argued, “but even with all the resources we have, we look comparatively rich, we’re still looking at alcohol, vapor, tobacco and a lot to do with just the basic compliance checks in the cannabis space” (audio – 2m). Moberg took issue with dormant licensed producers, suggesting some operations wait to produce for larger licensees. He asked for enforcement of WAC 314-55-075(7)(b): “If fifty percent production space used for plant canopy in the licensee’s operating plan is not met by the end of the first year of operation the WSLCB may reduce the tier of licensure.” Gress would repeat this suggestion later (audio – 6m). On price fixing, Moberg felt the suggestion was “too drastic” and discouraged some growing methodologies. He was unenthusiastic about vertical integration for producers and encouraged WSLCB to focus on more incremental changes. On pesticide testing, Moberg asked WSLCB to prevent their Quality Assurance Testing and Product Requirements rulemaking from levying more costs on the industry. There was general agreement from others on the Council. Moberg supported the increased budget for testing by the Washington State Department of Agriculture (WSDA), saying their random testing might be the only system in the regime which “can’t be cheated.” Gress and Rosellison concurred (audio – 5m). Moberg said that because of federal legalization of hemp, pesticides will start to be labeled for use on cannabis effectively permitting their use unless the state adopts more stringent standards. He warned that stories about pesticide contamination might be overstating bad actors in the industry and motivating consumers to shop outside it. Moberg lauded the work of Nick Mosely from Confidence Analytics identifying pyrethrins, an organic pesticide, and piperonyl butoxide (PBO) as the most common pesticides found. Moberg stated the pyrethrin action limit for cannabis flowers had been previously removed from rule, and believed it was a benign enough pesticide to also remove the action limit from concentrates (audio – 3m). Moberg advocated for the removal of licenses from circulation as a necessary market force. He asked if the receivership process would be an appropriate venue to prevent licenses from being sold to another entity. Gaston said that might be appropriate for licenses with violations, but wouldn’t be fair to businesses trying to recoup losses. Hauge protested that receiverships were designed to enable failing businesses to maximize asset return (audio – 6m). Moberg said a “complex dance” of transferring licenses in lieu of selling them shouldn’t be allowed, and asked for time-based constraints on license ownership change requests. Moberg would later add that the 30 day window to change locations in the event of eviction was another opportunity to transfer licenses that could be abused. Moberg told the Board the two colors of the 21+ Universal Symbol impacted label printing costs and asked if the colors counted towards the new color palette limits. Rosellison pointed out that the high number of Board Interim Policies—six since December 12th—“causes total chaos to small businesses” (audio – 11m). Rosellison described a regulated marketplace where good actors who want to follow the rules are at a competitive disadvantage. Rosellison claimed entrepreneurs challenge any system’s rules (“They’re always going to think outside the box”) and asked WSLCB to incentivise compliance. Rosellison suggested allowing retailers to sell products with less than 0.3% tetrahydrocannabinol (THC) and allowing processors to sell low-THC products outside of the recreational system. Garza offered that he had seen proposed legislation which Thompson identified as SB 5201. Gress confirmed WACA was participating in the legislative effort, which would also allow retailers to sell branded merchandise. Rosellison suggested encouraging compliance by issuing a memorandum to announce additional random pesticide testing under the Interagency Agreement between WSLCB and WSDA. Rosellison said the agency wasn’t using all of its 75 budgeted tests per month and could target large processors who buy up the “cheapest” product for concentrates. Moberg and Rosellison praised a recent WSDA pesticide compliance notice as a clear, useful update. Commending Rosellison for raising awareness about the logo for medically compliant cannabis products, Moberg said it was still not widely recognized in the industry, and not part of the training for medical cannabis consultant certificates. 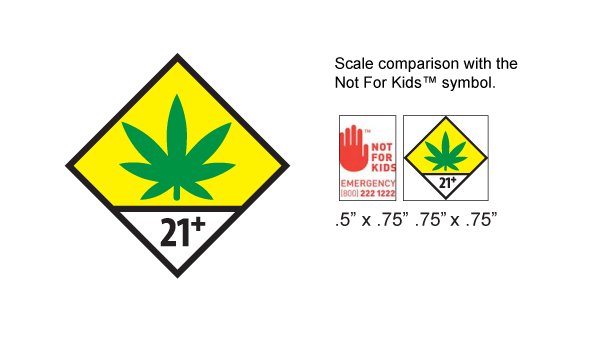 Rosellison argued that several cannabis product logos still had cartoon characters incorporated, and if the agency targets edibles packaging for improper labels they should enforce the rules for all products under WAC 314-55-105. She also expressed that given packaging material requirements, children were unlikely to access these products unless they were wielding a knife or sharp scissors, indicating a lack of supervision independent of the colorfulness of labels. Rosellison said unless these changes to rules were “rooted in research” and not “reefer madness” they would hurt small businesses without public benefit (audio – 4m). Rosellison was happy that members of the prevention community were reaching out to WSLCB, but noted The Cannabis Alliance’s past invitations to collaborate have been largely ignored. She encouraged the Board to ask prevention advocates to engage stakeholders in the cannabis industry directly. Articulating concerns about overproduction, Rosellison wondered how many consumers remained outside the market in part because of limits on claims the industry can make when describing products. Gress noted seeing retailer incentive programs offering their budtenders gifts for selling specific products, an illegal practice she claimed small producers couldn’t match. Gress suggested enabling growers to talk to budtenders would empower smaller operations to better advocate for the sale of their products. Gress encouraged higher fines for violations where intent to violate the rules is clear. Gress said consumer and retail focus on new cannabis cultivars made the limit on acquiring genetics and seeds from outside the state a burden on growers. Since the 15-day window for producers to source seeds had been removed from statute, Gress offered Alaska’s policy as a workable model for getting new plant genetics into the industry. Gaston concurred that customers often focus on whatever is new. Hauge said it was a new issue the Board would look at (audio – 3m). Gress thanked the Board for an interim policy on cannabis quarantine passed earlier this year. On equity, Gaston said more cannabis revenue dedicated to social justice programs would be agreeable, as would staff’s idea to incentivise new ancillary businesses for disadvantaged communities. Gaston proposed a minimum wholesale-to-retail price based on product type as a way to combat practices like undercutting or illegal pesticide use to increase yields. “Our margin is our margin,” he said claiming many retailers had to triple the wholesale price to break even. “Cannabis, since I was in junior high school, was $10 a gram and $40 a eighth. The fact that you can go out and buy a $25 ounce right now is on us.” Gress felt the proposal might promote poor quality cannabis. Hirschburg met with Hauge and Thompson on the topic of social consumption in November, and pushed the agency and organizations represented to share a summary of draft legislation on consumption lounges for retailers, direct-sales and tasting areas for producers and some processors, and special event permitting for cannabis similar to WSLCB’s special alcohol permits. Hirschburg argued the draft bill would guarantee growers a venue for sales and move in the direction of responsibly regulating cannabis-related behavior. Still looking for a legislative champion, Hirschburg said the draft was “a big step, but it’s actually a responsible step” before warning the state may continue lag behind places like California, Denver, Massachusetts or Alaska leading on social use, claiming accompanying tourism, and defining appropriate “socialization.” Rosellison was supportive, Moberg liked the concept but felt it diverged too far from consideration of what WSLCB could do. Gaston supported growers having direct sales and tasting areas, explaining that retailers were a convenience business, and that with proper buffers, people motivated to travel further to see producers directly were no threat to his market and their curiosity could help create better awareness about the industry (audio – 5m). Fauls said the recent notice to retailers about medically-compliant products and accompanying materials showed enforcement warnings had an impact. Garza assured him they were doing more of that “through bulletins, through enforcement or licensing” because of reports of bad behavior they’d received. Moberg encouraged an enforcement letter regarding discounts offered by producers. The agency’s memo to retailers was the top takeaway from the December 12th Executive Management Team meeting. Noting a consensus on overproduction, Fauls wondered if there was support for reducing canopy across all licenses. He referenced BOTEC’s analysis of adequate production and asked if the state had ignored this guidance. Gress pushed back, saying Tier 1 producers shouldn’t be reduced like larger operations. Moberg admitted that grower “psychology” tends to lean towards producing more. Frank Fauls, CFC – Regulatory change request. Summaries like this take work, help ours continue by supporting us on Patreon.